Chianti Classico Riserva ‘Gherardino’ is dedicated to the Gherardinis, the noble Tuscan family that founded Vignamaggio in the 1300’s. 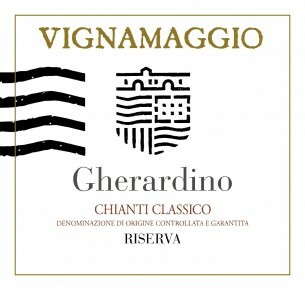 Gherardino is Vignamaggio’s Riserva bottling, which is the middle tier of the new Chianti classification pyramid, requiring a minimum of 24 months of ageing (between wood and bottle). Gherardino is a blend of 80-90% Sangiovese with the inclusion of 10-20% Merlot which adds volume and richness. The vines are between 20 and 30 years old. The sangiovese component of Gherardino ages in 15-20hl oak barrels for 18-20 months, while the merlot ages in 225lt French barriques. Once blended, the wine rests in bottle for additional 6 months. Chianti Classico Riserva Gherardino is rich, enveloping and textured to the core. Dark red cherry, plum, smoke, tobacco and spices flesh out on the racy finish. Enjoy with savory first courses, red meat and seasoned cheese. Grapes are harvested by hand betwen the end of September and beginning of October. Both alcoholic and malolactic fermentations are carried out in stainless steel vats at controlled temperature. The Sangiovese component of the blend is aged for 18-20 months in 15-20hl oak barrels, while the merlot is aged in 225lt French barriques. 6 months in bottle prior to release.